It’s always fun to point out features in ACT! that we know a customer hasn’t noticed. There is a little tab in ACT! that a lot of users overlook – the Relationships tab. The obvious use is to track the basic Org Chart type information. It’s a great place to relate managers to team members, sales reps to sales managers and the obvious assistants to the person in charge. When working with our customers, we may have an IT Contractor, a Sales Consultant, or an ACT! Certified Consultant related to the customer. Those are all relationships we’d like to keep tabs on, or should we say, keep on this tab. Since we have several IT Contractors that trust us with their customers ACT! hosting. The most common example we track is IT Contractors and their clients. We have the IT Contractor in our database as a Contact. Then we create a Contact for the customer. Creating the Relationship is pretty straight forward. 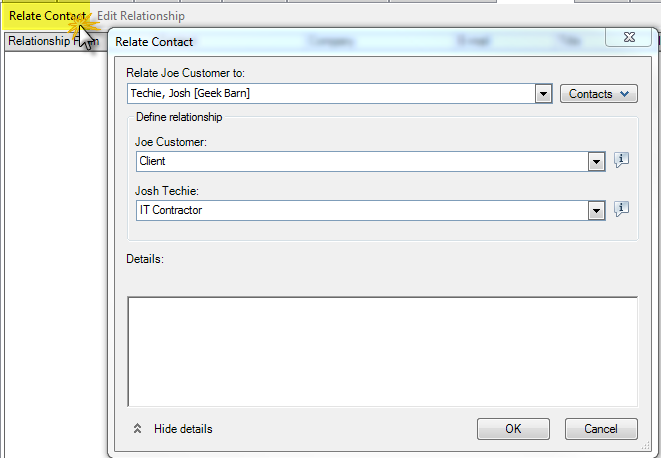 Now, when you are talking to Joe, the Customer, and you can’t remember the IT Contractor’s name, simply click the Relationship tab and you’ll instantly see. Or, if I’m working with the IT Contractor and I want to see a list of all of his customers we work with, same thing, just click the Relationship Tab. Then you can click the Contact’s name and bounce to the Contacts Detail view. Many of our customers have custom relationship lists, specific to their industry. Yes, the Relationship Type list can be customized to match your business. Just another QuickTip for helping you better use ACT!. If you need more, we’re here to help. Drop us a line at support@trilogycrm.com.